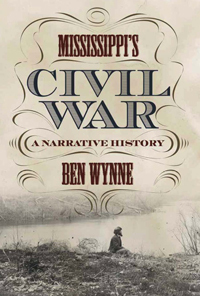 This book examines Mississippi’s Civil War experience. It begins with an introductory overview of the socio-political climate of the state during the 1850s and ends with a treatment of Mississippi’s post-war environment and the rise of Lost Cause mythology. In between, the work covers the pivotal events, issues, and personalities of the period. Wynne emphasizes the experiences of Mississippians—male and female, black and white—as they struggled to deal with the crisis. The political events leading to secession, Mississippians’ initial enthusiasm for war, voices of dissent, the disbursement of troops in and out of the state, the home front, freedom for the slave community, waning enthusiasm (both in the military and on the home front) as the war dragged on, defeat, and the ultimate struggle to turn defeat into a moral victory through Lost Cause mythology are also discussed. This book makes significant contributions to Civil War literature. First, while there are a number of works on individual incidents or battles during the war ( for instance, five or six studies of the siege of Vicksburg currently are in print), there are no works that cover the state’s overall experience in a social, political and military context. Second, while not ignored, events in the western theatre of the war often do not receive the same amount of attention as those that took place in the East, particularly in Virginia, and Mississippi was a focal point of the western theatre. Finally, the book emphasizes the real rather than the romantic. Most Mississippians both at home and in the Confederate army undertook the war effort with great enthusiasm without realizing the ultimate cost.